The internet is filled with puppies, but are any of them real? Last week a Russian puppy named Max led Grocott’s Mail reporters to four fake websites. After a local Makhanda (Grahamstown) couple lost R30 000 and the promise of a puppy in an online scam, our team started digging. What we found initially was impressive, or so we thought; however, four websites soon turned to 29. With our noses to the ground, the scent of similarity was strong with these 29 sites, and here is exactly why. The above graphic depicts what we call the “pedigree” of a pet scam; or a family tree. We have three main ‘parents’; Happy Tales (yellow), Fidelity Pets (blue) and Golden Pups (red). Even though these families are clearly separate from eachother, you will notice that certain ‘puppies’ have split-colours; such as yellow and blue or blue and red. This means that those ‘puppies’ have characteristics, or traits, from two parents, or some cases, even all three. Though the pedigree looks and behaves like a family tree in terms of shared traits, it is not in chronological order. After a careful analysis of data from all 29 sites, the clearest way to see connections between all sites is through the traits that they share. What do we mean by shared traits? Our team used this criteria to determine similarities between puppy and parent websites. If the pedigree isn’t chronological, then how did we narrow it down to three parents? As our reporter discovered, all ‘tails’ lead to Happy Tales, Fidelity Pets and Golden Pups. All of the ‘puppy’ sites share the most traits with these parent sites; it is as if the website creators used Happy Tales, Fidelity Pets and Golden Pups as a template or benchmark for other sites. These three sites also lead our reporter to all of the secondary, and tertiary ‘puppy’ sites. As the pedigree shows; there are first, second, third, fourth and even fifth and sixth generations of ‘puppy’ sites. This means that after conducting a 10 point criteria and search analysis of any given site, more websites were uncovered as a result. But in the end, all sites lead to these three contenders. Although our reporter cannot confirm that all 29 sites are linked, the pedigree shows that each family shares features from the one we’ve coded with the colour blue: Fidelity Pets. Because of the ‘family’ connections, we are strongly inclined to believe that all the websites are linked. What this data tells us is that Fidelity Pets appears to be the biggest ‘parent’ (with the most ‘puppies’). Congratulations Fidelity Pets, looks like you’re top dog! If you’re still skeptical about the link between these sites, we have a few facts proving some of the ‘puppies’ heritage. It’s a tie folks! Well done, Champion Retrievers and Mini Teacup Pom! These two sites were created on the same day, at the same time and on the same host site. Both sites are clever re-makes of earlier generations, Golden Pups and Teacup Mini Poms. 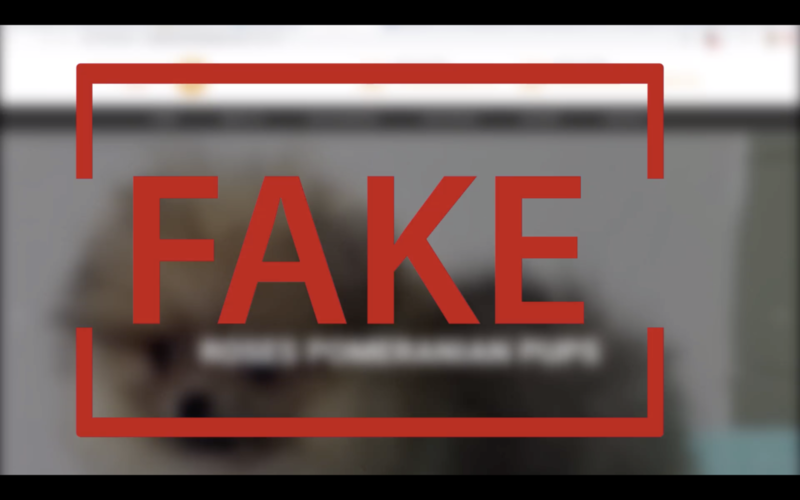 Golden Pups and Teacup Mini Poms were shut down after the publication of our article on 6 March 2019, which exposed both sites as scams. On 7 March at 8:01am, Champion Retrievers and Mini Teacup Pom were born! Still not convinced? Just like their ancestors; these two new sites also list a Queenstown address. A simple Google search reveals that both properties are residential and one is currently for sale. A well-deserved first place! The second prize goes to a site with more bark than bite: Cookie Puppies. In the WHOIS information of Cookie Puppies, the registrant organisation is listed as “Rose Pomeranianp UPS”. Rose Pomeranian is another ‘puppy’ site identified by our reporter. Cookie Puppies and Rose Pomeranians are hosted by two sites from the same company. Two related host sites; and two related websites. A good show by Cookie Puppies, better luck next time. The third place prize is for one of our more seasoned contenders, a ‘parent’ site. Congratulations Happy Tales! Happy Tales has been reported on multiple online platforms as a ‘scam site’, as well as a TIMESlive article from 24 December 2018. The site is also a carbon copy of another ‘puppy’ site; SA Pet Home. Both sites have the same design, layout and logo. Adding more to the prize, another ‘puppy’ site, Grace Pet Kingdoms, has the same client testimonials from Happy Tales. Well done Happy Tales: whoever said you can’t teach an old dog new tricks has never met you!